My body was feeling it after the Kvalvika hike, and I gave up on my original plan to do the hike a second time to catch the midnight sun. Instead I ate a big bowl of carbs and slept it off. 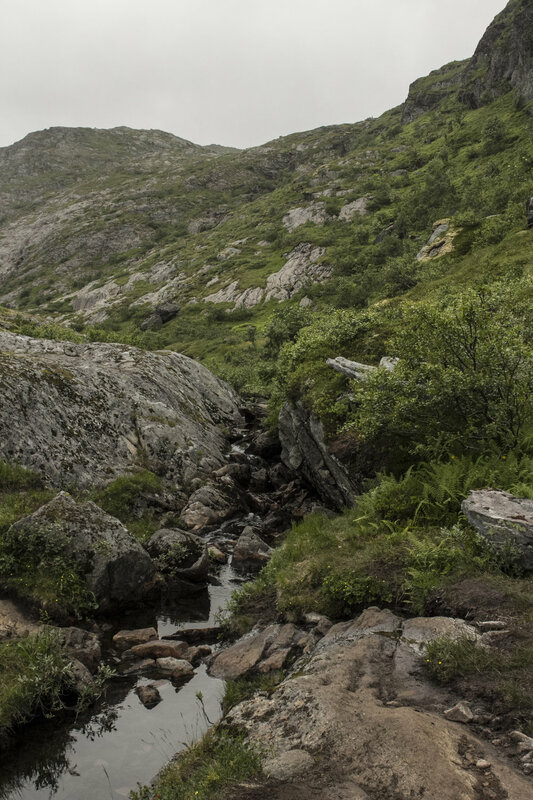 The next day I hitched a ride to Sørvågen to attempt a bigger hike up the mountains to the Munkebu hut. That was to be my next cabin stay but again the keys had all been taken by the time I showed up. I still had all day to kill, so with my enormous pack strapped in I stubbornly resolved to do the hike anyway. In year 11 I trekked for a week through the desert in and around Broken Hill. Either because I blocked out the worst of it, or because I was younger and more able-bodied back then, the Munkebu hike felt a hell of a lot harder! The path snakes upward for almost 6km each way and is barely discernible as it passes through muddy bogs, rocks and shrubbery. There were two particularly steep passages with a row of chains bolted into the boulders for hikers to abseil up and down. Coming down was quicker but no less difficult when my legs were already aching and I had to find a way to hop, jump and abseil down from the peak with my pack still attached. Despite the pain of my objecting body, I did feel proud for making it to the end. I ate some lunch sheltered under a boulder by that wretched cabin with the best views all around me before I made the painful descent back to civilisation. After the failed cabin attempt, I had no place to sleep so I crawled back to the hostel in Å to beg for a place to crash. I was prepared to just wait out the night at a bus shelter or something but by some miracle they found a room for me. I woke up today with a half baked plan to take an early bus to Reine and then a ferry to another hike to Horseid beach. Hobbling to the bus stop in the rain made it quite clear that I would've had a terrible time on that hike, so I gave up and wrote off today to tend to this blog, ready for another fresh attempt tomorrow.